The US’s dominance in scooping Nobel prizes for work in the natural sciences could be nearing an end, according to a new analysis of previous winners. 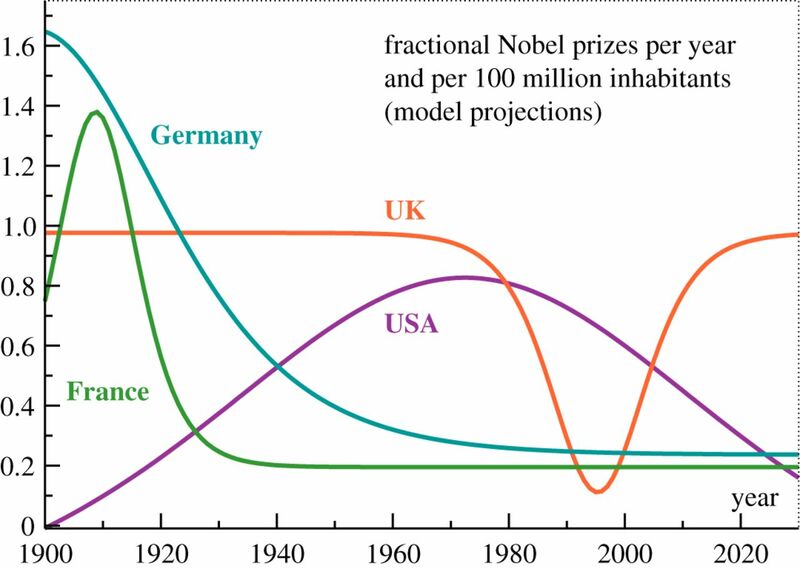 Carried out by physicist Claudius Gros from the Goethe University in Frankfurt, Germany, it also finds that the UK has won the most Nobel prizes per capita, with Germany coming second and the US a close third (R. Soc. Open Sci. 5 180167). 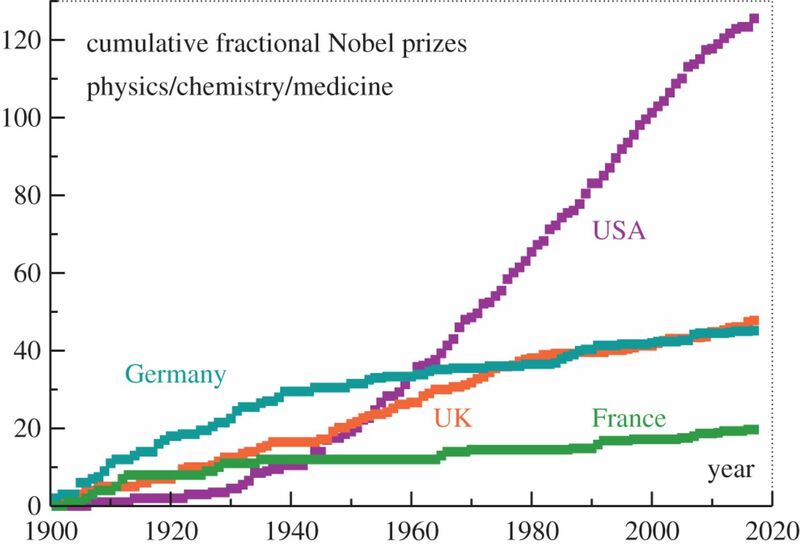 Since they were first awarded in 1901, scientists who are nationals of the US, the UK, Germany and France have won the most Nobel prizes in physics, chemistry, and physiology or medicine. Around 120 laureates have been American, 40 British, 40 German and 20 French. 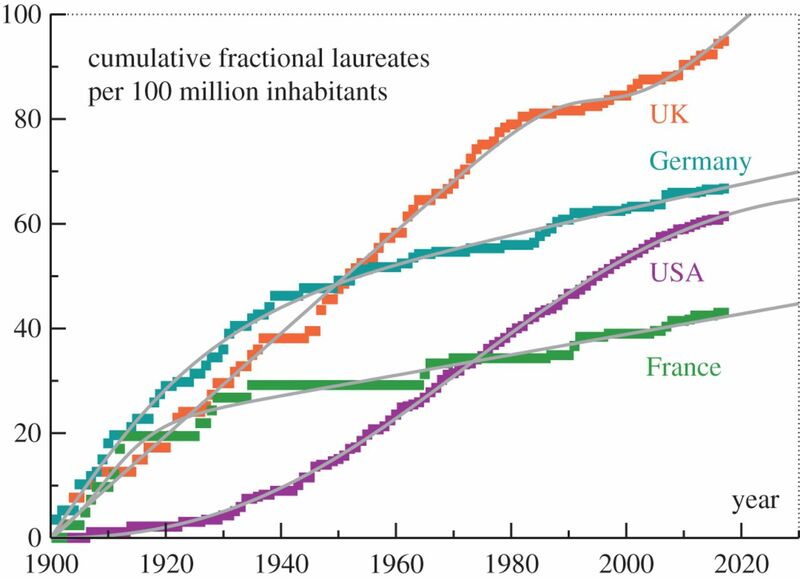 To determine Nobel-prize productivity, however, Gros factored out population size, particularly given that the US population has more than quadrupled from 76 million in 1901 to 327 million today. That will put us down to 0.17 per 100 million inhabitants by 2030, when the population should be: 327,000,000*e^(0.02*18) = 468,698,719 (from the Growth Formula: N = N_0*e^rt, r = growth/death rate of 0.02, t = time). That's going to be a lot of mouths to feed and employ with fewer and fewer minds to generate new ideas, industries and thus, employment of the masses. Our slide from "exceptionalism" will inevitably follow.